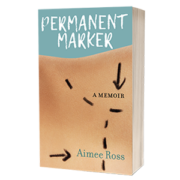 Aimee Ross published Permanent Marker: A Memoir in March 2018. She completed her MFA in Creative Non-Fiction Writing at Ashland University in 2014, and her writing has been published on lifein10minutes.com and SixHens.com, as well as in Beauty around the World: A Cultural Encyclopedia, Scars: An Anthology, Today I Made a Difference: A Collection of Inspirational Stories from America’s Top Educators, and Teaching Tolerance magazine. “You are the author of your own life story,” promised the skinny strip of green bubble letters outlined in neon pink that used to hang above the chalkboard at the back of my classroom. Back then, I believed in that language arts message as hallowed inspiration. Only recently, I had become a character in my own life, and I didn’t know who was actually authoring the story. The one I was sick of telling. The one that delivered the same embarrassing reaction. I was almost killed in a car accident. The other driver was under the influence. He died. I had to be resuscitated. Yeah, I was recovering from a heart attack that had happened five months earlier. A heart attack. Yes, only forty-one years old. I know, crazy. It was stress. I had just told my husband of eighteen years that I wanted a divorce. I had recovered physically, yes, but my spirit, crushed between major life-changing moments, had shattered into countless irretrievable pieces, and I couldn’t make any sense of the mess. Guilt from ending my marriage and guilt from a young man’s death (survivor’s guilt?) haunted me. I wondered if I’d had a mid-life crisis. I wondered if God had sent that car into mine to punish me for the divorce. And I worried that it would define the rest of my life. I needed the randomness of The Trifecta to have meaning. I needed to understand my survival. And I knew I was the only person who could put me back together again. When I returned to teaching school six months after the accident, I discovered that my classroom was just what I needed. I was back in my comfort zone surrounded by teenagers, once again fueled by their energy. I sat in a chair at the front of the room, relishing being alive and back in my classroom. When I assigned my students a writing project, I found myself writing alongside them every class period. No matter the prompt I gave, my writing always took me back to the Trifecta in some way, shape, or form, and before I knew it, I had a small collection of writing through which I attempted to process what had happened to me. I had done what I’ve always done when I wanted to organize the thoughts or solve a problem in my head: write. Fate and circumstance stepped in when I learned a local university offered a master’s program in creative writing, and I decided to apply immediately. I had always wanted to earn a graduate degree, and to do so in writing sounded like a dream. I could use the two years to write about and process my circumstances for a degree, and hey, maybe I’d have something publishable at the end. It couldn’t hurt to try. Maybe I’d also find some peace along the way, the answers to the questions that haunted me: What had happened to me? Why was I still alive? And, who was I now? I felt like I might already know the answers, but they were just outside of reach, tangled up and twisting around one another. So I kept writing. Soon, through the regular rhythm of working out events on paper—or on a laptop screen— I saw my story unfold. Yes, it was messy, disjointed even, but I finally had an outlet for my grief and anger. Sometimes, random bits of the story came out of me at odd moments on scraps of paper, or a line would form in my mind while I vacuumed. Other times, I could sit down and write a part of the story with such clarity and insight that I shocked myself. My story finally started to make sense. Writing became my therapy, the words on the page a clear and thoughtful intervention. Soon I could even see the real-life, true-gold, only-can-be-gotten-from-almost-dying (twice!) wisdom I’d gained along the way. They were hard-earned lessons that must be shared. Don’t take anything for granted. Not Clifford the Big Red Dog stuffed animals or clean, cotton sheets or walking, one foot in front of the other. Not steamy, hot showers; your raggedy blue baby blankie; or breathing, as deeply as you want, whenever you want. Not hugging your children, playing catch with your pup or sleeping in any position your body likes. All of it matters. Embrace the power of simple gestures. A get-well card in the mail, a bouquet of flowers from someone who’d survived his own trauma, or an already prepared meal of chicken fettucine and garlic bread can give life meaning. Return the favor when you can. Or better yet, pay it forward. Let others in to help you heal. My mom, dad, brother, sister, and children were the caretakers and supports who kept me from falling apart, from completely losing myself. And when I wanted to close myself off from the world that seemed just beyond my reach, visitors—whether my writing group or teaching colleagues or former students—kept me grounded and open enough to attempt optimism. Eventually, because I allowed people to surround me, I became well enough to return to school, where my students turned in to my therapists, whether they knew it or not. Draw strength from nature and all of your moments with it, whether planting herbs, flowers, and vegetables outside in the spring; having someone take you for a drive just as fall leaves are turning colors; or hiking a path to pick black raspberries in the humidity of July. Watch the sunset from the wicker chair on your front porch every single night, even in the frosty cold of winter, and stargaze from your driveway whenever you can. Nature presents its own healing—its own reason for being. Life can change, or even end, in a moment. It cannot be controlled. That’s just the way it is. You can try to guide it, making choices or even setting a direction, but most of the time, that will be knocked out of your hands unexpectedly. Sometimes you might get the control back, but other times—in fact, a lot of the time—you just have to wait. And either way, you can only control yourself—no one and nothing else. Life, no matter who’s writing the story, just happens. And you can’t get out of the way or hide or run from it. You just live it, one moment at a time, making your way through, one challenge at a time, attempting to live with courage, accepting each moment gracefully. That’s all you can do. According to Dr. James Pennebaker, a pioneer in studying the healing nature of writing, expressing what happened to you through words on a page allows you to organize and understand your experiences and yourself. This, in turn, provides a sense of control, something you probably lacked during the traumatic event(s) that led you to need to heal in the first place. When the writer has given the traumatic experience a structure and meaning, not only are the emotions drawn from the experience more manageable, but the story most likely then has a resolution, or ending, which eases the trauma. Writing your story could provide the therapy necessary to feel whole again. I know, because I am no longer a character in that old, sad story, defined by trauma. The process worked for me. Turns out you really can be the author of your own life story. Why not try it? What prompted you to write your memoir and share your very personal experiences with readers? How did reliving your most painful experiences—a divorce, a heart attack, a near-fatal car crash—affect you? Did it feel therapeutic, or was it harder than you anticipated? My younger sister is a humor writer, and she’s been influencing and guiding my writing for years, no matter whether I was working on an essay, a lesson plan, a presentation, or an application. I’m also a huge fan of Abigail Thomas’s writing style, which I studied during my MFA. She writes almost conversationally, and she experiments with voice and chronology (or lack of) brilliantly. Both Jill Christman’s (Darkroom) and Cheryl Strayed’s (Wild) writing also have influenced my style and not just their books—both women are prolific essay writers with unique, straightforward creative voices. After hearing the same advice over and over again, from editors, writers, and publishers alike, I decided, “Hey, maybe, they all know something I don’t (duh, Aimee),” so here it is: Figure out the story you want to tell and why it needs to be told. Then get it all out in writing. Every bit of it. After you do that, then you look for patterns and similarities and gaps, or ways you could experiment or change the structure. 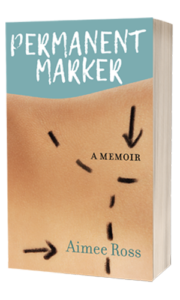 What’s the primary takeaway you hope readers get from Permanent Marker? KiCam Projects is delighted to welcome our newest author, Aimee Ross, whose debut book will release in March 2018. 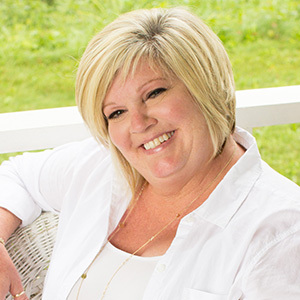 Aimee, of Perrysville, Ohio, has a remarkable story to tell of living through the “perfect” heart attack, later surviving a horrific car crash, then rebuilding her life and finding love and contentment along the way. A mother of three, Aimee is also an award-winning educator with a passion for reading, writing … and Ricky Martin. We’re thrilled to be partnering with Aimee to tell her story. If you’ve ever gone through a major life change or had to reconstruct your self-image—in Aimee’s case, both literally and figuratively—you’ll want to mark your calendar for March 14, 2018. Welcome to the KiCam family, Aimee!